Throughout the world, there has been remarkable progress in improving child survival, with decline in global under-five mortality rates by nearly half from 1990 to 2013. In a few Sub-Saharan countries, years of concerted action against common childhood diseases have also resulted in remarkable reductions in infant and under-five mortality. Some of these countries, including Uganda, have achieved or even exceeded the previous Millennium Development Goals targets. There is an emerging global pandemic of noncommunicable diseases such as cardiovascular disease, diabetes, and cancer with disproportionately higher rates in developing countries, whose public health systems are often poorly organized and inadequately funded. The majority of high priority public health interventions in these countries focus on more prevalent childhood infectious diseases such as malaria, diarrhea, tuberculosis, pneumonia and the current HIV pandemic. Cardiovascular care programs have tended to be in the lower strata in most government public health delivery priority lists in many of these resource-challenged countries. As a result, many children in low- and middle-income countries of the world continue to suffer high morbidity and mortality from both acquired heart disease and congenital heart disease (CHD). This is because of the unavailability or lack of sufficient subspecialized cardiac care facilities in many of these nations. Pediatric cardiac surgery and cardiac interventions are only available in a few Sub-Saharan African countries. Improvement of access to pediatric cardiovascular care represents a new frontier to further reduce childhood mortality in these emerging countries. We here in describe the evolution and current status of pediatric cardiovascular care in Uganda, highlighting the unique aspects of establishment of pediatric cardiac services, current constraints, and future plans. Uganda is a land-locked country in the eastern part of Africa covering an area of 241,551 square kilometers. It is located on the equator at an altitude of 1500 feet above sea level. It is also the source of the River Nile that arises from Lake Victoria, the largest freshwater lake in the world. With the third highest birthrate in the world, Uganda has a large and growing population. Of its over 34.6 million people, children (defined as <18 years) constitute 55% of the population, with 48% being younger than 14 years and 70% being <24 years. The country's infant mortality rate is 53 per 1000 live births, total fertility rate per woman is 5.8, and life expectancy at birth is 63.3 years. Uganda is a low-income country with 80% of the population involved in agriculture as a source of livelihood, 19% of the population is poor, and 83% of the people live in rural areas. The literacy rate of persons aged above 10 years is 72%. The average per capita income in the country is $474. Average national monthly household income is estimated at 125 USD. 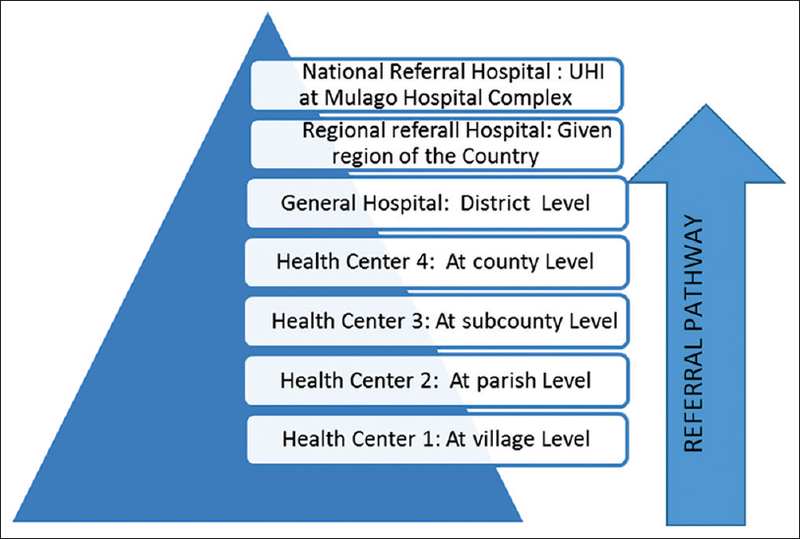 Uganda's health-care system is organized in tandem with the administrative units of the country [Figure 1] and [Table 1]. Most health units are owned and managed by the government while a small number of health units are owned by missionary/religious organizations (private not-for-profit units) and very few are privately owned (for profit units). The private health facilities play a complementary role to the public health structures. The government offers free basic health care to all citizens in the country. However, in public hospitals and health centers, poor funding coupled with lack of trained personnel translates to unavailability of specialized pediatric cardiac care to the majority of the country's children. The average child with heart disease faces enormous obstacles in accessing cardiac care services in Uganda. A child only has a realistic chance of being recognized with heart disease if they meet a medical doctor from a district hospital or health center 4 level upward. This is usually through cardiac auscultation done by a medical doctor or a clinical officer. Apart from the Uganda Heart Institute (UHI) which is a public government funded facility and some private hospitals in the capital city Kampala, accurate echocardiographic examination for children is only available at two other public regional referral hospitals (Gulu Regional Referral Hospital in the north of the country and Mbarara Regional Referral Hospital in the west). Children from other regions have to find their way to the capital to have a definitive diagnosis. The UHI is the only center in the country with diagnostic, interventional, and surgical treatment facilities for children with heart disease. The UHI Division of Pediatric Cardiology currently has three pediatric cardiologists (two of whom are actively involved in pediatric cardiac intervention) and four fellows in training. There are six adult cardiologists with seven fellows in training. The institute has four cardiac surgeons and two cardiac anesthesiologists. There is one cardiac intensivist in the country being supported by cardiac anesthesiologists, cardiac surgeons, and pediatric cardiologists currently staffing the Intensive Care Unit (ICU). The institute has four ICU beds, four high dependency unit beds, and four critical care unit beds. The general inpatient's ward has 28 beds. The other private hospitals in the city provide mainly outpatient care for children with heart disease, with admissions limited to emergency cases before referral to the UHI. The pediatric cardiologists at the UHI provide on-call coverage to a few hospitals and clinics in the city. Patients being evaluated at the UHI pay about one-third of the market rates in the private hospitals for consultation, diagnostic evaluation, and medical follow-up. For instance, a pediatric echocardiogram costs about 12 USD at UHI compared with 45 USD in private for-profit facilities. For a population of about 34.6 million, and a population growth of 3.03%, it is estimated that annually about 8300 children are born with CHDs in the country. Of these, 2000 are severe enough to require cardiac interventions. CHDs cause the majority of pediatric cardiovascular morbidity in Uganda. Ventricular septal defects (VSDs) are the most common (26.5%) CHDs. Tetralogy of Fallot (TOF) is the most common cyanotic CHD (7%) because a vast majority of them survive beyond infancy. There is a peculiarly a high prevalence of truncus arteriosus (5% of all total CHD compared with 1%–2% reported elsewhere). Coarctation of the aorta (CoA) is almost nonexistent at 0.26% of all CHDs, which is most likely because either these cases remain unrecognized in the population or critical ones die in early infancy. Rheumatic heart disease (RHD) is the most common acquired heart disease among children, accounting for about 45.5% of all acquired heart disease of all cases seen in the UHI, followed by dilated cardiomyopathy (22.4%) and pericarditis (8.8%). Outpatient attendance shows a decreasing trend in the number of patients with endomyocardial fibrosis though it represented 7.1% of all acquired heart diseases in children seen between 2007 and 2014. There is an increasing trend of childhood obesity, especially among the rich and middle-class families in urban areas. A study found that 10% of adolescent school children in the capital Kampala were obese, with obesity being significantly associated with having hypertension. This has been partly due to changing diets, with many children consuming high fat-containing foods coupled with limited physical activity. Many schools lack playgrounds and devote less time to sports in schools due to competition for good academic grades. In addition, many homes have small compounds that do not allow for adequate play. It is not uncommon to find children glued to the television the whole day as parents are away working. Specialized Cardiac Care in Uganda began through the establishment of a Cardiac Clinic at Mulago Hospital in 1958, providing initially diagnostic services and medical care. In 1968, closed heart surgery services commenced. These included ligation of persistent ductus arteriosus (PDA), repair of CoA, pericardiectomy for constrictive pericarditis, and closed mitral commissurotomy for severe mitral stenosis. By 1970, open heart surgery (OHS) employing total circulatory arrest under profound hypothermia was established and closure of simple congenital heart lesions such as atrial septal defects (ASD) was being performed. However, with political turmoil of the Idi Amin era, surgical cardiac care came to a standstill in the 1970s until early 1980s when services were reestablished. OHS using conventional heart–lung machines for cardiopulmonary bypass commenced in 2007 at the UHI with support from foreign expatriate teams coordinated by Children's National Health System, Washington DC, and Samaritan's Purse Children's Heart Project, Washington DC. Over the next 3-year period, foreign expatriate teams through surgical skills transfer workshops placed emphasis on risk category-1 (Risk Adjustment for Congenital Heart Surgery-1 score) procedures for congenital heart lesions (e.g., repair of ASD, VSD, and CoA), building human resource capacity, and ensuring quality of care. In 2010, a dedicated cardiac theater was commissioned and the local cardiovascular surgical team concurrently started performing unassisted OHSs. This local team has to date built capacity to perform complex congenital heart surgeries including risk category-2 and 3 procedures (repair of TOF and valve surgery) with survival rates after OHS being comparable between procedures performed independently by the local team and those performed with visiting teams [Figure 2]. With OHS services now available for CHDs, fewer patients need to travel abroad for treatment [Figure 3]. This has saved the nation on capital flight costs on treatment abroad while enabling a large number of its population to access the service in-country. Support supervision over a 5-year period (2010–2014) was provided through regular visits by expatriate teams. In addition, consultancy services with expatriate teams abroad are availed through a telemedicine facility donated by Cisco and Rotary International that includes ability to share echocardiographic images in real time to discuss complex cases. Through the International Quality Initiative Collaborative for congenital heart surgery, the institute undergoes bi-annual clinical audits and receives guidance on its performance as compared to other international centers. Pediatric cardiac catheterization at the UHI began in February 2012 when two patients underwent balloon pulmonary valvuloplasties (BPVs) under fluoroscopic guidance. In May 2012, a dedicated catheterization laboratory building with a biplane system was commissioned at the Institute. This was followed by the training of one pediatric cardiologist in interventional cardiology using hands-on skills transfer at site and short-term placements at Amrita Institute of Medical Sciences, Kochi, Kerala, India. The focus of the intervention program has been diagnostic catheterizations, BPV and PDA device closure, and emergencies such as balloon atrial septostomies and pericardiocentesis. To date, over 200 pediatric catheterization procedures have been performed at the UHI by the local team independently and together with visiting teams [Figure 4]. The local pediatric catheterization team intends to embark on VSD closure and balloon mitral valvuloplasty in the near future. The adult catheterization team at the UHI includes four interventional cardiologists who now routinely perform coronary angiograms, percutaneous coronary interventions and permanent pacemaker, implantable cardioverter defibrillator and cardiac resynchronization therapy implantation procedures. RHD is endemic in Uganda and it is the most common acquired heart disease among children seeking care at the UHI. Most children present late with advanced disease, multiple valve involvement, and the development of complications., Using the 2012 WHF criteria for diagnosis, the RHD prevalence rate in primary school children aged 5–15 ranges between 1.5% (Kampala) and 4% (Gulu) – with prevalence of “definite” RHD between 0.5% (Kampala) and 1.5% (Gulu) among primary school children. With a population of 34.6 million and 30.2% of the population aged 5–14 years, it is estimated that as many as 50,000–150,000 of children in this age group in the country have definite RHD needing long-term care. Dedicated RHD care services are currently available at the UHI and the Joint Clinical Research Center in Lubowa (in the capital Kampala) and at two other regional referral hospitals (Mbarara and Gulu) where a national RHD registry is functional. These RHD care programs are supported by the Medtronic Foundation through the Case Western Reserve University, the Children's National Health System in the USA, and Rotary International through the Rotary Club of Mengo, Kampala. Long-term cares at these sites involve medical therapy for heart failure and medical complications of RHD, secondary benzathine penicillin prophylaxis, and RHD research. Plans are underway to establish an outreach RHD Clinic at Lira regional referral hospital this year. The rest of the country has no or limited dedicated RHD data or care services. The valve surgery program for RHD at the UHI is slowly picking up, with plans to have at least one procedure each week. The Salaam Center in Khartoum has been the main referral point for patients in need of valve replacement. Due to unavailability of international normalized ratio monitoring in peripheral centers, many patients will still have to make the trip to the capital city after valve replacement. Catheter-based balloon mitral valvuloplasty is intermittently offered in the UHI by the adult cardiology team in the presence of visiting teams. Local cardiologists are progressively gaining skills to be able to do the procedure independently by the end of 2017. The UHI started a cardiology fellowship training program in 2010 to meet the pediatric cardiovascular care needs of the country. The faculty includes both local and visiting staff. This has involved a local apprenticeship component, training by visiting teams during open heart surgical and cardiac catheterization missions, and case conferencing through telemedicine with doctors at the Children's Health System in the USA. The foreign component of training has included attachments in India, Italy, Germany, South Africa, South Korea, Malaysia, the USA and attendance at national, regional, and international conferences. Currently, there are four fellows in the Pediatric Cardiology Training Program. Key partnerships have helped build a sustainable pediatric heart care program in Uganda. With considerable resource constraints, the strides made at the UHI would not have been possible without vital partnerships with local and international organizations that have provided avenues for funding, training, and research collaboration. We recognize the great efforts of several organizations in helping to build a sustainable pediatric heart care program in Uganda. The Government of Uganda has created an enabling environment to help deliver quality superspecialized cardiac care to children at the UHI. Some of the key partners are shown in [Table 2]. There are many population, health systems, resource, and policy constraints to the delivery of an effective pediatric cardiovascular care service in the country. Currently, pediatric cardiac diagnostic facilities are only available in three public hospitals and a few private facilities in the capital city. Despite attempts by the UHI to extend cardiac outreach services to regional referral hospitals in the rest of the country, these visits are few in between and the pathway to definitive surgery or intervention is currently only available to those who make the trip to the city. There are challenges with making a cardiac diagnosis since the vast majority of the children are attended to in lower level health centers by nurses and the clinical officers. In the settings where infectious diseases predominate, specific cardiac auscultation during physical examination is the exception rather than the rule. This is even further compounded by the weak referral systems, where patient transport systems are extremely poorly organized and left for individual families to sort out privately. Fetal echocardiography for prenatal screening is only available at the UHI and a few private hospitals in the city. Pulse oximetry is only available at a limited number of regional referral hospitals and often is not used for screening for critical cyanotic heart disease in the newborn period. As a result, many of these children may be misclassified as birth asphyxia or other cause of respiratory distress. The whole East African region has severely limited access to prostaglandin E for critical duct-dependent lesions and natural history selects those who can survive the critical 1st weekdays of life. While surgical outcomes for treatment of the two most significant CHDs (VSD and TOF) are optimal when surgery is performed in the 1st year of life, postoperative care in smaller children remains a challenge. In addition, many children come to surgery later in life when physiology and anatomy are less favorable and risk is higher. Unfortunately, due to health system constraints, many other children with CHD become inoperable because of missing a critical window for optimal surgical outcomes. There are major challenges of local funding for definite care for children who require intervention, with many procedures subsidized by government or charities. Unfortunately, the current volume of CHD surgery at the UHI results in some charities prioritizing taking children abroad for surgery. This has not only caused the flight of foreign currency but also retarded the development of sustainable in-country care programs. Emphasis on sustainable growth in surgical volume and quality improvements initiatives will hopefully result in reversal of this trend. With a very small middle class, children with heart disease from poor backgrounds often form the bulk of the burden of pediatric cardiovascular disease in developing countries (either because they have higher birth rates on average or cannot access critical health-care services that reduce risk of having acquired heart disease or CHD). As a result, families are often unable to afford the costs from initial diagnostic cardiovascular evaluation to definitive therapy. A summary of other key challenges is presented in [Table 3]. As a developing country, many gains remain to be made to increase access to high-quality cardiovascular care to children in the whole country. With the government establishing regional universities and hopefully regional medical schools, it is hoped that these will come with additional numbers of specialist doctors who will drive the formation of specialist cardiac clinics in the different parts of the country. The Ministry of Health has embarked on rehabilitating and re-equipping district and regional hospitals with establishment of ICUs in the regional referral hospitals. However, some of these ICUs are nonoperational because of lack of critical human resources to run them. Provision of pulse oximeters in the health centers and pro-active pulse oximetry screening for newborn children with respiratory distress will be another window of opportunity to increase referral for cardiac evaluation. Fully operational ICUs will also enable simpler, closed heart operations such as PDA ligation and pericardiectomy to be performed in these hospitals as human resource capacity for cardiovascular surgery improves. This will help decentralize pediatric cardiac surgical services in the country. In May 2016, an Act of Parliament was passed to establish the UHI as an autonomous public entity. It is hoped that this will enable the institute appropriately budget for recruit and motivate staff and help circumnavigate some of the innumerable procurement dilemmas under the current arrangement. The other frontier that presents enormous opportunity is the involvement of nurses and other nonphysician health workers in the recognition and early referral of children with heart disease. For instance, they could be retrained to have a high index of suspicion in children with obvious clinical signs such as genetic syndromes, recurrent pneumonia, growth failure, and clubbing in addition to cardiac auscultation. Nurses could also be trained to run RHD clinics in health centers and district hospitals for asymptomatic or stable patients where there are no heart doctors. [Table 4] summarizes some of the key priorities in the delivery of pediatric cardiovascular care in Uganda. With the return to stability in nearly the last three decades, the development of pediatric cardiovascular care in the country has made great strides. However, funding gaps, few trained personnel, and poor access to highly specialized consumables in pediatric cardiac surgery and cardiac catheterization interventions remain a challenge to overcome. Increased number of public regional universities with medical schools and the reequipping of regional referral hospitals in the country present opportunities to ensure that a vast majority of the nation's children have access to pediatric cardiovascular care and diagnosis. We acknowledge the roles of all individuals and organizations that continue to make possible the delivery of sustainable pediatric cardiovascular care in Uganda. The UN Inter-agency Group for Child Mortality Estimation: Levels and Trends in Child Mortality: Report 2014. New York: UNICEF; 2014. Available from: http://www.data.unicef.org/fckimages/uploads/1410869227_Child_Mortality_Report_2014.pdf. [Last accessed on 2016 Aug 10]. Ugochukwu O, Jerome A. An audit of intensive care unit admission in a pediatric cardio-thoracic population in Enugu, Nigeria. Pan Afr Med J 2010;6:10. Uganda Bureau of Statistics. The National Population and Housing Census 2014 – Main Report; 2016. World Bank Statistics, United Nations Population Division, United Nations Educational, Scientific and Cultural Organization (UNESCO), UNICEF Report; 2013. Uganda Bureau of Statistics. Uganda National Household Survey 2012-2013. Lwabi P, Lubega S, Olega T. Spectrum of congenital heart disease among children presented at the Uganda Heart Institute. Cardiovasc J Afr 2013;24(1):179. Lubega S, Aliku T, Lwabi P. Echocardiographic pattern and severity of valve dysfunction in children with rheumatic heart disease seen at Uganda Heart Institute, Mulago Hospital. Afr Health Sci 2014;14:617-25. Bongomin B, Lubega S, Lubega I. Hypertension in Adolescents in Day Secondary Schools in Kampala: Prevalence and Associated Factors. Unpublished Master's Thesis; 2012. Okello E, Wanzhu Z, Musoke C, Twalib A, Kakande B, Lwabi P, et al. Cardiovascular complications in newly diagnosed rheumatic heart disease patients at Mulago Hospital, Uganda. Cardiovasc J Afr 2013;24:80-5. Aliku TO, Lubega S, Lwabi P, Oketcho M, Omagino JO, Mwambu T. Outcome of patients undergoing open heart surgery at the Uganda Heart Institute, Mulago Hospital complex. Afr Health Sci 2014;14:946-52.